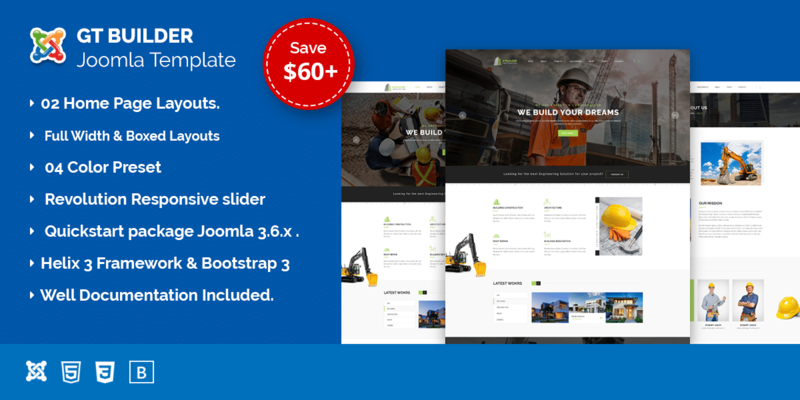 GTBuilder is a clean and modern Joomla template for all kinds of construction and building. But you can use it for any kind of business like corporate, creative, business etc. It is easy to use. GTBuilder template comes with necessary features and pages for business such as About, Projects, Project detail, Services, News/ Blog, News Detail, Team, Team Member Detail, Contact page, k2 pages and others Joomla related pages. QuickStart package Joomla 3.6.x . Premium Extensions included – Saved $66. Helix 3 Framework, Bootstrap 3.x.